Another beautiful #StillOurBaby story, from the lovely Megan and her precious little girl Carys. Megan discusses life in NICU and parenting after neonatal loss. An incredibly inspiring story. A special thank you to Katie for letting me share Carys’ story. My name is Megan, and I am the mum of Carys, our little Sleeping Beauty. I found out I was pregnant back in 2015, totally unplanned and thrown into a world of decisions and life changes I was in no way prepared for. It was terrifying, but the moment I saw that tiny being growing inside me on the 12 week scan, nothing else mattered. I was going to protect that little human from all the bad things this world threw our way, and I was going to love them more than anything else. The pregnancy went pretty smoothly; the 20 week scan came around fairly quickly and we were both over the moon when the sonographer scanning me said that our little girl was healthy and doing well. I excitedly told family and friends that I was expecting a girl and started to plan properly for this new exciting adventure. However, this normal, ‘easy’ pregnancy all ended very abruptly on the 5thOctober 2015. Her movements had reduced, and they weren’t as strong, and I started to question if something wasn’t quite right. So, on my lunch break from work, a friend drove me to the hospital to get checked over. Little did we know that we wouldn’t be going back to work after lunch, and I was about to give birth, 13 weeks early. Within an hour or so of being at the hospital, we were rushed into surgery, and she was born. 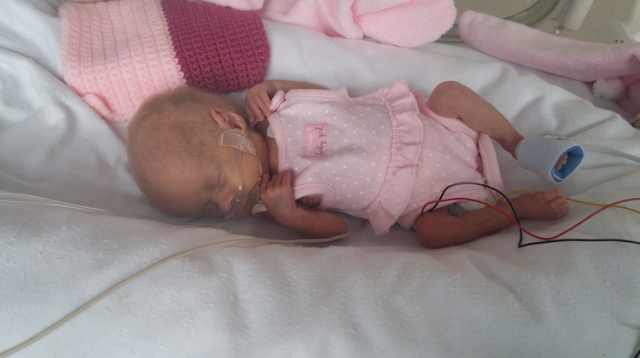 Carys Aurora Greasley, was born at 15:16 on the 5thOctober 2015, weighing a tiny 1lb 3oz. She didn’t cry, she struggled to breathe alone, but she was alive. They let me see her briefly before they took her up to the neonatal unit, and I just couldn’t quite believe that I had made her, she was so perfect and tiny. Later that evening, when I was in slightly less shock and had told my family we were both okay, Carys’ dad (Patrick) and I were both taken to meet our little love properly for the first time, and it was without a doubt one of the best moments of our story. She was covered in tubes, and wires and monitors, but she wriggled around with her little pink hat on, fist pumping the air and showing us both that she wasn’t giving up without a fight. 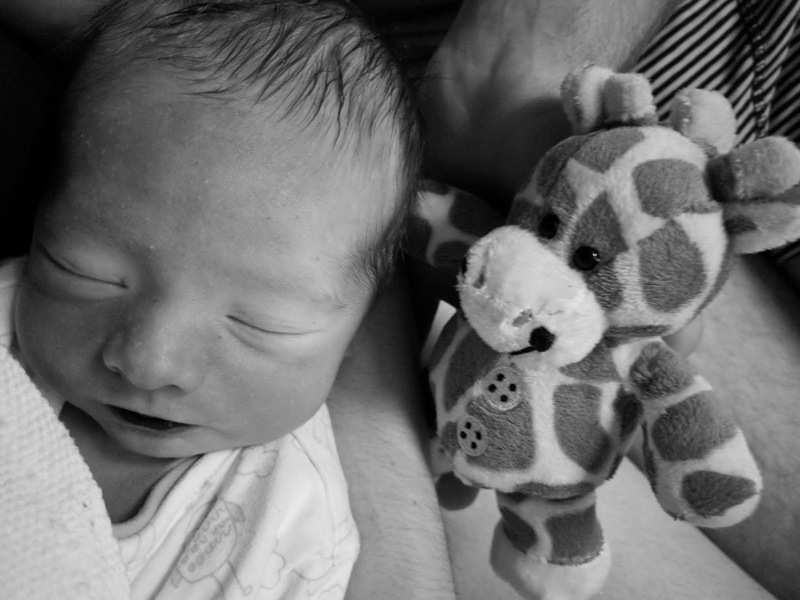 The consultants were honest with us at this point, she was so much smaller than she should have been for 27 weeks and had obviously been struggling for a couple of weeks inside me, so the first 48 hours were touch and go. But she battled on. She overcame so many obstacles, defied all the odds week after week, and slowly started to grow and develop. Her personality shone through in every aspect of what she did, and I questioned on a daily basis how we had managed to make such an incredibly strong and brave human being. She was doing so well that she moved hospital to ensure we were closer to family. She moved out of intensive care, and there was even talk about the prospect of finally taking her home with me. On the 29thNovember 2015 though, our world was turned upside down once more. 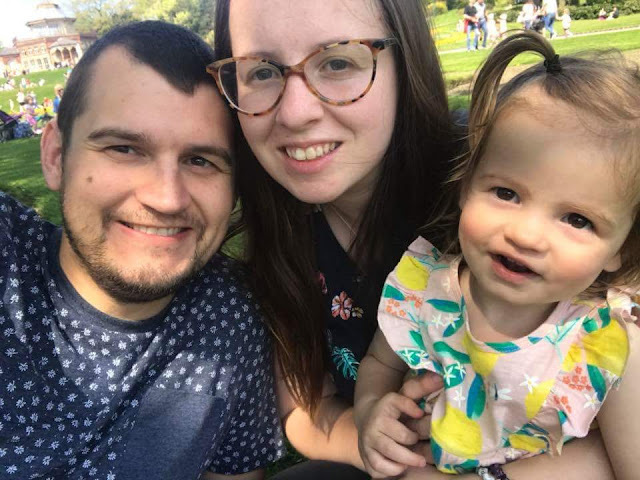 The hospital called to say Carys had taken a turn for the worse overnight, and they believed she had developed Necrotising enterocolitis (NEC). I rushed to the hospital, feeling unimaginable guilt that I wasn’t there to hold her hand, watched as they prepped her for surgery, and watched as a crash team tried to save her. I couldn’t leave her, so I stood helplessly around a group of medics who frantically ran around trying to keep my tiny little 2lb baby alive. We held her as her heart took its final beats and prayed this wasn’t happening to us. We spent the rest of the day with her, had our only family photos as a family of three, and had close family come to support us. Then we left the hospital, with the boxes of her things, knowing we wouldn’t be returning the next day to see her bright blue eyes staring back at us from the incubator. Fast forward to now, and we are just over two and half years from that day. Memories of her scent, of her beautiful face, of her personality are captured in limited photos, and items of hers that are stored in a memory box, but most importantly in our minds. I am ashamed to say those memories aren’t as clear as they used to be, that I can’t remember the wrinkles on her forehead in as much detail as I could back then, but I guess that is the reality of time, memories always fade despite our best efforts to save them. I dream about her daily. I dream about the life I could have had with her, about the family we could have been. The waves of grief still hit me hard, and I can whole heartedly say that I will miss her till the end of time. Parenting a child that I no longer hold in my arms has been far from easy, but I imagine that she would have kept me on my toes if she had lived too. I have tried hard to keep her memory alive over the last few years, and we will continue to do this forever. 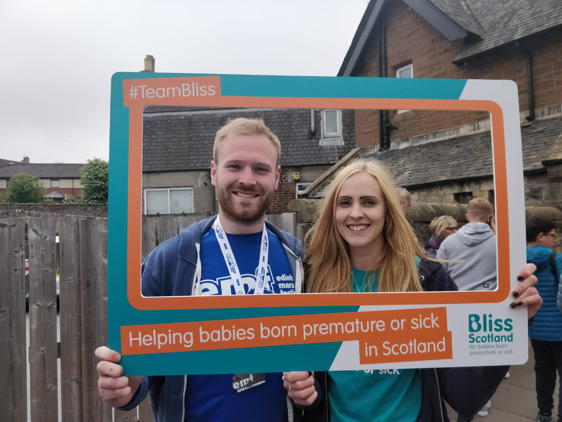 We have raised money in her memory for Bliss and Sands, two charities that were incredible to us throughout Carys’ life on the neonatal unit, and in her passing. We held a charity event for her first birthday, held bake sales, have taken her on adventures, and Patrick has even run 8 half marathons in the last year to represent the 8 amazing weeks we had with her (actually 9 now, and he has the running bug too so there will be a lot more runs in her memory I imagine!). She helped me find my passion in clinical research, and I decided to carry out an MSc in her honour, dedicating my dissertation to her. I hope one day I can continue the research further. 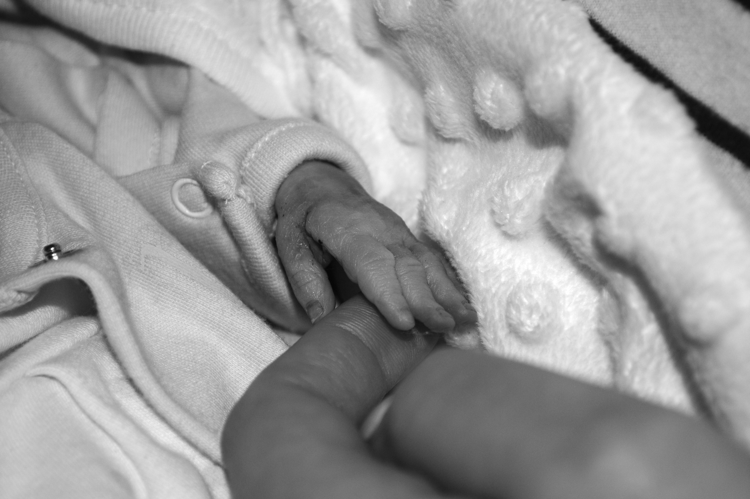 I hope one day that Carys' legacy will be the reason that care for infants at risk of NEC improves. It never quite seems enough though, I always feel like I am not doing enough for her, that she deserves more from me. I have felt immense pride, joy and love since Carys was born. She showed me what it feels like to love someone unconditionally, and it is a love stronger than I can ever explain. She showed me strength, bravery, and determination, and because of her I still wake up every day and survive. I was told at the start of this journey that things would get easier, that over time that gut-wrenching pain would soften, and in some ways, it has. But there will forever be those days when we both sit there and question why. Grief still knocks us back, possibly catching us more off guard than in those earlier days. The reality of baby loss really is lifelong. We obviously miss those moments we physically shared with her, but my god do we miss the moments that we didn’t. The first walk, the first word, the first day at school, the graduations, the future - that’s our reality now, a lifetime of what ifs. Grief is forever a part of us now, just like Carys is. They will forever shape our lives, and she will forever be on our minds. Our little Briar Rose, our Sleeping Beauty for always. 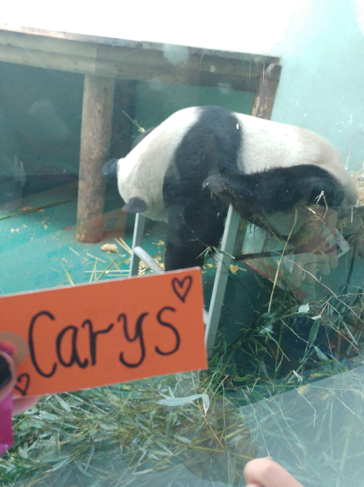 Thank you Megan, for sharing your beautiful Carys with us, such a special little girl. If you'd like to be a part of the #StillOurBaby series please contact me. This week's #StillOurBaby is Georgia and Henry's story. Georgia discusses neonatal death and the aftermath of parenting a child that has died. This is so beautifully written, a real raw, honest account of life after loss. Please note this post contains images of precious Henry. I dedicate this to Henry, Jonah and every child ever missing from their parents' arms. Hi all, it's a real privilege to be included in the #StillOurBaby series. My experience of infant loss was the sudden and unexpected early neonatal death of my son Henry. I could easily talk about Henry all day so when Katie gave me the opportunity to tell his story I jumped at it. On the 11th October 2017 after a quick, straightforward labour my husband and I welcomed our first child into the world. Henry was born calm, alert and apparently healthy. We were told we could take him home that same evening, our future looked bright. We had two normal hours together as a family of three when we noticed that Henry had became floppy, unresponsive and had stopped breathing. An emergency alarm sounded, a crash team filled the room and medics worked for over 30 minutes trying to save our son's life. As I sat amongst the commotion in that room a stone cold certainty came to me, life was never going to be the same again. A doctor spoke to us, they'd tried everything, there was nothing else they could do and they were going to stop resuscitation. Just like that the perfect little human I had birthed only hours before and who I loved more than anyone else the world was gone. Our son had died. It felt like a hole had opened up beneath me and I was free falling into a void. There really are no words to describe the pain of losing a child, it is utterly devastating. We spent that night in the hospital's bereavement suite. My husband's parents arrived in the early hours and sat vigil while we slept, my mum arrived a few hours later. We introduced Henry to his grandparents, held him, took his hand and foot prints, kissed him, told him we loved him and less than 24 hours after he was born had to give him to a stranger to be taken to a hospital in another city for his coroner ordered post-mortem. When he left that room it felt like all the colour left with him. Our bright future was suddenly dark. There was surely no way forward from this. Soon after Henry went away I developed sepsis and became quite ill. I didn't care. I saw this illness as a physical manifestation of the pain I felt inside and welcomed the softening of reality and my escape into delirium as my body fought the infection. I was in hospital for nine days, my husband by my side the whole time “we're going to get through this, for Henry” he'd tell me over and over again. His presence got me through. I thought about those two precious hours when our family had been complete. 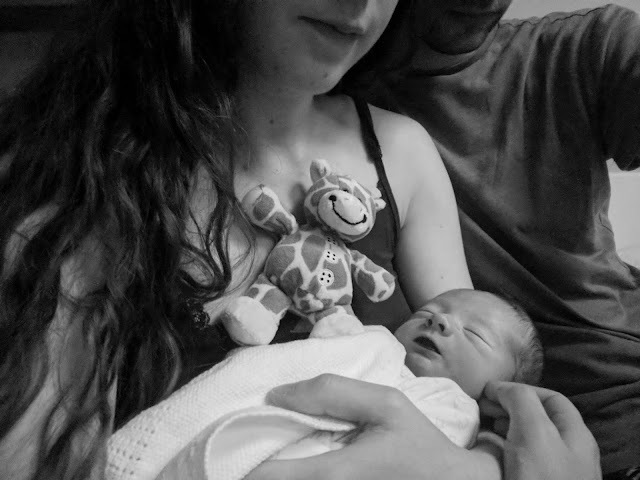 I held onto the memory of my husband holding our newborn son and the feeling that my heart would burst with love, remembered thinking as I'd looked at the two of them 'they are my world, my reason to be' and with that memory I felt a fire kindling in my soul. Things weren't going to be how we'd planned but they'd still be. I would survive this, if not for myself then for them. And so it began, my journey into motherhood. One I hadn't chosen and couldn't change. Those early days were incredibly dark. Lowering my son's coffin into a hole in the ground went against every maternal fibre in my body, how could I leave my son here? It was just all so wrong, it should have been him burying me in 50 or 60 years time. I wanted to go down there, scoop him up and never let him go. The parental instinct to protect a child doesn't die when they do and I still feel the need to mother my son, for me this means ensuring he is remembered. I fear that because Henry's life was short he will be forgotten. I fear that the significance of his loss will not be acknowledged or understood. The grief of a baby isn't just for the life lost but the life not lived, Henry will be missing from every family meal, holiday and celebration forever, it is a grief that will last a lifetime. We live in a society that avoids difficult conversations and the death of a baby is one of the most difficult. People are unsure what to say or fear they'll hurt a parent by mentioning their dead child but as a parent desperate to talk about my child it hurts more when he's not acknowledged. By chance soon after Henry died I came across a community of bereaved parents openly talking about child loss on Instagram. As I read their experiences of grief and life after loss I recognised my own feelings. I started sharing Henry with them, his life and death, my highs, lows and strange moments in grief. I connected with mums and dads who had lost children at all stages of pregnancy and beyond, no two stories were the same but we were united by the shared experience of this alternative parenthood. In February I was invited to attend a bereavement care and reducing stillbirth conference. Listening to other parents talk about the work being done to break the taboo surrounding stillbirth and infant death was empowering and fed the fire in my soul. 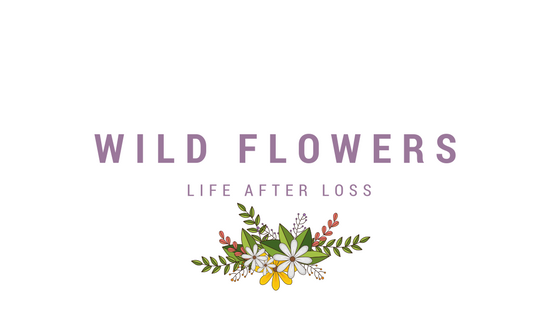 I came away from that day feeling inspired, determined to add my voice to those already talking and in March started blogging about my experience, sharing it for the first time with people outside the baby loss community. It's still early days for the blog but the response so far has been amazing. I hope it helps other parents feel less alone in their grief and provides advice to anyone supporting someone during the death of a child. I hope by adding my voice to those already talking about baby loss and grief the conversations will continue to grow, they're difficult conversation to have but it's important that we do. I'm now seven months into my parenting journey. Henry's post-mortem results came back with no known cause of death so I have no answers about why my seemingly healthy, full term baby died. An inquest into his death has been opened which is expected to take place later this year. My husband and I are slowly finding our new normal as we learn to parent our missing child. I don't know what the future will bring but I know my love for Henry will never dim and I'll never stop talking about him, the boy who made me a mother and lit the fire in my soul. Henry this is all for you darling. Thank you again to Georgia for sharing Henry and life after loss. I am honoured to be able to share your story in the #StillOurBaby series. I will never forget the look on your face when you walked into the bathroom that evening. The toilet already covered in blood but you somehow held it together and called an ambulance. You spent 45 minutes calmly talking to the lady and updating her. You arranged someone to sit with Violet and kept your cool, despite being terrified. You continued to try and make me smile, even when being rushed to hospital in the ambulance - both of us knowing this wasn't going to have a happy ending. I will never forget waking up after surgery and seeing the relief on your face but also the fear, knowing what I was about to be told. You stayed with me every step of the way and I will be forever thankful that I was never alone in this. You somehow organised child care for V, when I couldn't even string a sentence together. You made sure Jonah was always with you or with me. You got our families here and made sure everyone knew what had happened so I wouldn't be overwhelmed. Despite our world falling apart, you still managed to keep this family unit together. Thank you for holding me at 4am, when I just couldn't sleep or hold it together anymore. Thank you for always wiping my tears and thank you for giving me the space I need to grieve. Thank you for just knowing when I'm having a bad day, even without me saying a word. Thank you for crying with me and for not being afraid to talk about our baby boy with anyone that will listen. But most of all, thank you for loving me even though I am no longer the person I was when we met. This wasn't the life we had planned but it is our life. You are my rock, my soul mate and my best friend. You are the most incredible Daddy to Violet and to Jonah. And I know that you would do anything to make this better.